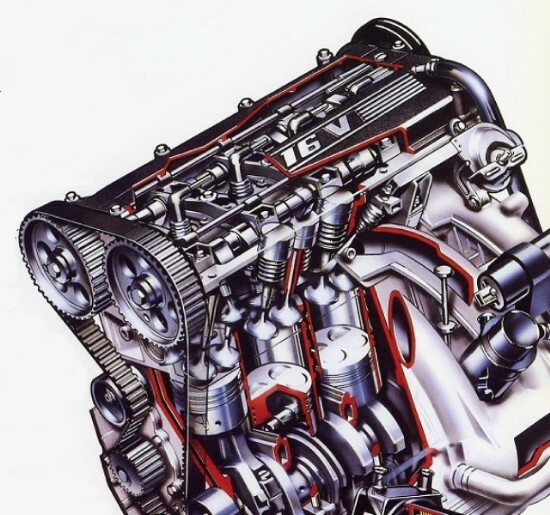 The majority of the BX 16v engines were the non cat version fitted with Motronic 4.1 engine management (2 row ecu) which is explained in detail in the Technical sub-pages. The later engines were fitted with the Motronic 1.3 management (3 row ecu) utilising a knock sensor mounted on the front of the engine block, this allows the ecu to adjust ignition timing if pinking occurs. The cam pulleys are numbered and there seem to be several factory combinations – The most common variations seem to be the early engines using a #2 exhaust cam pulley and a #4 inlet cam pulley this later changed to a #2 cam pulley on both the inlet and exhaust cam. The combination of #2 and #4 seems to give the more harsh power delivery often noticed with the mi16 engine. The engine is of all alloy construction utilising removeable cast iron cylinder liners. This is the cat equipped engine using the Motronic 1.3 engine management (3 row ecu) along with a lambda (oxygen) sensor and is essentially the same as the D6C apart from the details below.These differences are achieved using lower height pistons and the common cam pulley arrangement is a #3 inlet cam pulley with a #2 exhaust cam pulley. It appears that the #3 pulley was used to improve power delivery and help make up for the loss of power due to the cat and lower compression ratio. The D6C engine is fitted to the majority of UK BX 16 valve models and is a development of the 8v engine. Introduced in July 1987, the essential difference is the 16 valve double overhead camshaft cylinder head, this head is based upon the legendary T16 cylinder head and spent 6 years in development alone. The camshafts are driven by a toothed belt tensioned by two idler rollers. The need for valve clearance adjustment is eliminated by the incorporation of hydraulic tappets (cam followers). The pistons have been re-designed, with valve head recesses machined in the piston crown and the gudgeon pins are now of the “floating” type, secured by circlips in the piston. The undersides of the pistons are cooled by oil jets located in lubrication pipes within the crankcase. The crankshaft has lighter balancing counterweights with a damper fitted to the sprocket end. Pressurised oil is supplied by an oil pump located within the sump pan, the pump being driven by chain from the crankshaft. An oil to water heat exchanger is also fitted to which the disposable canister type oil filter is fitted. Further details of the cylinder head are available in the Downloads section which features pages from the Technical Manuals.